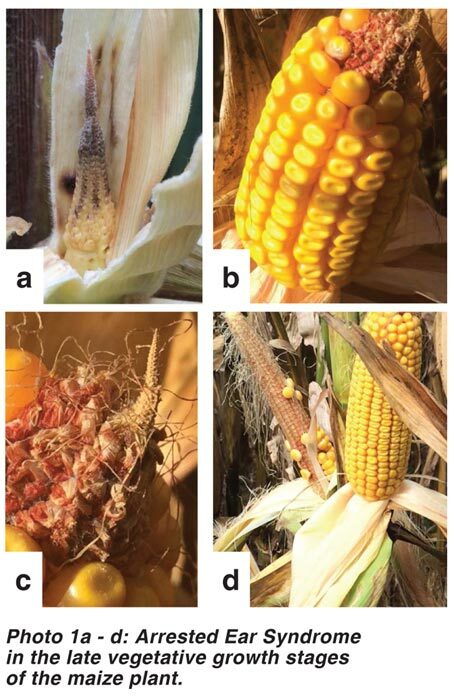 Arrested Ear Syndrome (AES) also called Blunt Ear Syndrome, a relatively unknown phenomenon in South African maize production, has stuck its head out in isolated areas this past season. Some farmers have realised only half of their yield expectation in certain fields due to high incidence of AES. While largely unreported in South Africa, this phenomenon has been reported sporadically from the USA corn-belt since the late 1990s. AES is not caused by a pest or disease. It is linked rather to plant stresses at a sensitive stage of ear development causing partial or complete abortion of the ear. This occurs during the late vegetative growth stages of the maize plant. See Photo 1a - 1d. Showing the effect of and various degrees of ear arrest resulting from AES. In Photo 1a the ear has arrested completely and is undeveloped. Photo 1b has partial arrest. The base of the ear is normal but the top two-thirds of the ear are absent. Note the arrested primordial remnant on the tip of the ear in photo 1b. Photo 1c shows a close up of this remnant ear tip. Photo 1d shows an array of AES symptoms observed in a land – from almost normal ears to cobs without kernels to complete arrest. In all other aspects the maize plant with an arrested ear appears normal. As the season progresses stems and leaves of plants with severe ear arrest will often colour red or purple due to sugar deposition in these organs. The stunting or absence of the ear has a direct impact on the yield potential of the affected land. In lands with a high percentage of arrested ears one would expect the yield loss to be in a similar proportion to that of the AES. One of the most common theories proposed to explain AES in the USA is cold stress. In particular when associated with a sudden drop in average temperature. Due to the unpredictability of AES the exact cause and timing of the stress event that results in ear arrest has been difficult to determine or replicate, despite various studies that have been undertaken. In 2007 numerous reports of AES emanated from the Midwest corn-belt in the USA. Researchers from Purdue University investigating some of these incidences noted that a common thread linked many of the reported cases. In nearly all of these cases of AES a pre-tassel application of crop protection chemicals, often including adjuvants, had been applied. In 2008 these researchers designed some demonstration plots to test if these sprays could have increased the incidence of AES. In their demonstration they included three fungicides sprayed alone and in various combinations with insecticides, adjuvants, spray additives and herbicides. The different treatments where then assessed for AES and compared to an unsprayed control block. 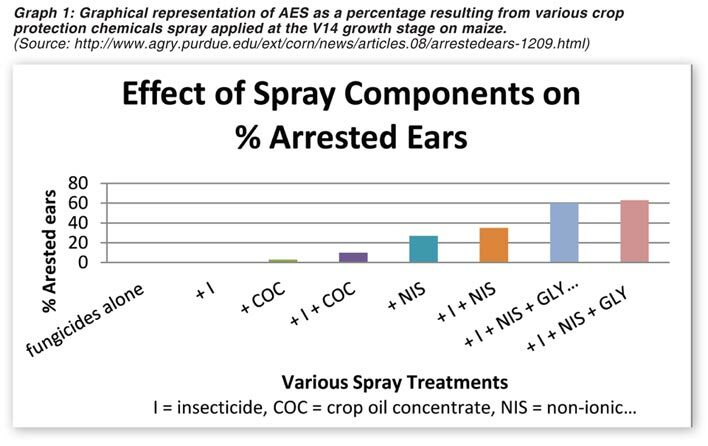 From Graph 1 it would appear that the more components that are added to the spray mix, the higher the rate of AES. Fungicides alone or fungicides plus an insecticide were no different to the unsprayed control from an arrested ear perspective. AES appears to be linked to the presence of non-ionic surfactants (NIS) and crop oil concentrates (COC), both of which are common ingredients in adjuvants, and to multi chemical tank mixes. Abide rigorously to crop protection chemical labels. V10 - VT growth stages of the maize plant. If a spray is vital within this window, apply only the chemical required for the intervention. Do not include additional adjuvants or extra crop protection chemicals/ foliar fertilisers to the spray mix. A final thought: Crop protection chemicals, by design, are applied to protect the crop and maintain its yield potential and, therefore, can be construed as a good thing, however the old adage: ‘You can’t get too much of a good thing’, does not necessarily apply in this instance. Article submitted by Grant Pringle, Agronomist: Pannar Seed.